After 8 years of Chris Christie, New Jersey needs to rebuild services. Governor Murphy has introduced a budget to do just that. Instead of relying on budget gimmicks and one-shots, Murphy wants to invest in our communities by ensuring millionaires pay their fair share and by closing corporate loopholes. But some Legislative leaders are talking about shutting down state government or even more health care and pension cuts to public workers before raising taxes on millionaires. 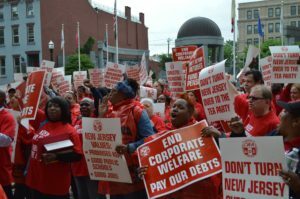 New Jersey needs sustainable, new revenue– not one-shots or cuts that balance the budget on the backs of public workers. Take action by calling your NJ State Senator and your two NJ Assembly members now. Tell them to support Governor Murphy’s budget with sustainable new revenue, including a millionaire’s tax. Make Three Calls for a Fair Budget! This entry was posted in Uncategorized on June 14, 2018 by cwalocal1037.